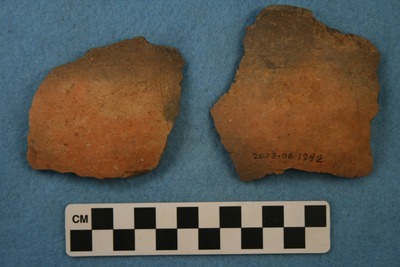 "41UR315, Burial 38, Vessel 224" by Timothy K. Perttula and Robert Z. Selden Jr.
DECORATION (INCLUDING MOTIF AND ELEMENTS WHEN APPARENT): The upper rim panel appears to be decorated with a single and centrally placed horizontal engraved line. There is at least one short diagonal engraved line drawn from the central horizontal line. There is a faint engraved design on the lower panel that has a hooked arm element that is part of a scroll, and a triangular-shaped scroll fill zone that has a single hatched column in it. Taylor Engraved compound bowl, Vessel 224, Burial 38.